Russell A. Barkley, PhD, ABPP, ABCN, is Clinical Professor of Psychiatry at the Virginia Treatment Center for Children and Virginia Commonwealth University School of Medicine. Dr. Barkley has worked with children, adolescents, and families since the 1970s and is the author of numerous bestselling books for both professionals and the public, including Taking Charge of ADHD and Your Defiant Child. He has also published six assessment scales and more than 280 scientific articles and book chapters on attention-deficit/hyperactivity disorder, executive functioning, and childhood defiance, and is editor of the newsletter The ADHD Report. A frequent conference presenter and speaker who is widely cited in the national media, Dr. Barkley is past president of the Section on Clinical Child Psychology (the former Division 12) of the American Psychological Association (APA), and of the International Society for Research in Child and Adolescent Psychopathology. He is a recipient of awards from the American Academy of Pediatrics and the APA, among other honors. His website is www.russellbarkley.org. Kevin R. Murphy, PhD, is founder and Director of the Adult ADHD Clinic of Central Massachusetts in Northborough and is also Research Associate Professor of Psychiatry, State University of New York Upstate Medical University in Syracuse. He was previously Director of the Adult ADHD Clinic and an Associate Professor of Psychiatry at the University of Massachusetts Medical School. He has published extensively on adults with ADHD and consults widely on the clinical diagnosis and management of ADHD in adults. 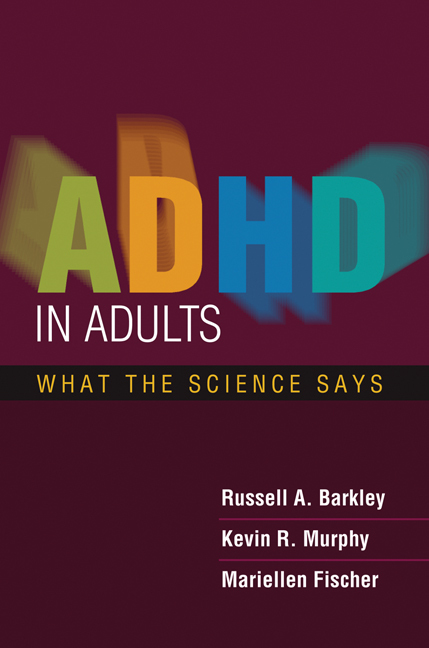 Dr. Murphy served as the coinvestigator on the research study of clinic-referred adults with ADHD reported in this volume and conducted the clinical evaluations of all of the adults in that project. Mariellen Fischer, PhD, is currently in private practice and was previously a pediatric neuropsychologist and Professor in the Division of Neuropsychology, Department of Neurology, Medical College of Wisconsin. Dr. Fischer has published numerous articles on ADHD, developmental psychopathology, and neuropsychology. She and Dr. Barkley have reported the earlier results of the Milwaukee longitudinal study of hyperactive children, the adult outcome of which is presented in this book. Dr. Fischer served as coinvestigator and the Milwaukee site principal investigator on the longitudinal study reported in this volume.